The homie Freaky P reached out to us at FLH to see if we could help spread the word about a memorial event happening in St. Louis. For those of you who have considered themselves a Juggalo for more than a dozen years or so, do you remember the Underground Psychos contest? If not, there was this ninja with a rapping vampire gimmick who called himself HavoK. He got pretty far in the competition, placing 6th overall. 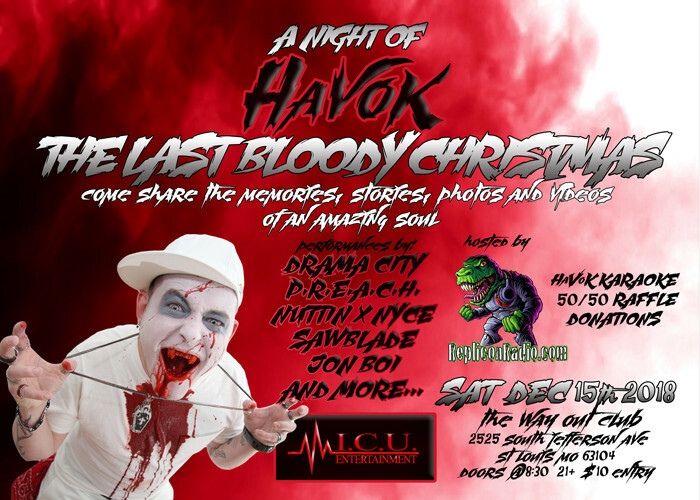 Unfortunately, we got the super stale news that HaVoK passed away as of November 13th of this year. While the cause is still unknown, his homies have banded together to throw a show in his memory called A Night of HaVoK: The Last Bloody Christmas! The show is happening this Saturday, December 15th at The Way Out Club. This is a 21+ Only show and tickets are $10.00 at the door. Our condolences go out to HaVoK’s friends and family. Hopefully sharing your favorite memories about him at this event will help bring some closure. RIP homie!